Training is a fundamental aspect of our work at TWFTW . We train people throughout the world in Bible translation, offering a Diploma in Bible Translation and MTh in Bible Translation Consultation courses. Since our training programme started, in 1981, more than 80% of students have gone on to be employed in the field of translation. The purpose of our integrated training is to give those who feel themselves called to Bible translation the opportunity to obtain practice-oriented training. Our focus is on building a core of trained and qualified indigenous Bible translators. Ultimately we aim to create opportunities for them to develop to their maximum potential. Our training consists of formal training, non-formal and on-the-job training. The Diploma in Bible Translation programme takes 4-5 years to complete. The formal training is delivered in intensive modules. Typically, we have 4-6 weeks of intensive modules per year for 4 1/2 years or 2 x 3 weeks per year over 3 years together with practical work and assignments. The intensives are followed by self study and on-the-job training under the guidance of a mentor for the rest of the year. Similarly, our MTh in Bible Translation Consultation combines academic rigour with practical experience through an internship. We aim to involve students in translation within the first two years of their training. We believe that our integrated approach sharpens translation skills as actual translation experience is increased and complemented by a range of intensive modules. Through our training programmes we seek to develop the whole person. This includes attitudes, skills and knowledge that are crucial for the work of Bible translation. To read more click here. The sequencing of modules, duration of the DBT programme and manner of learning are to some extent flexible. By adapting our programme to the requirements of the students and the location, we are able to deliver it effectively in different contexts. We seek to provide training in the countries of prospective translators, with the least amount of disruption to their own lives and those of their communities. To see where our training is offered check our training calendar. Our DBT training is open at both ends. This means that we consider applications on a case by case basis from those who do not satisfy all entrance requirements. On the other hand we seek to provide sufficient academic grounding to enable students to proceed with further studies. 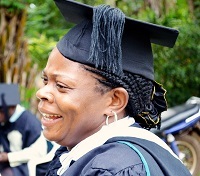 Our Diploma in Bible Translation is recognised by several academic institutions. The distance education institution SATS (South African Theological Seminary) exempts DBT graduates from a number of undergraduate courses. They can complete a BTh degree programme in their country of residence through distance education at SATS. After completing a BTh Honours they can enrol in our MTh in Bible Translation Consultation and study for a PhD in Theology with the focus on Bible Translation. In Ethiopia, the Ethiopian Theological College in Addis Ababa exempts DBT graduates from a number of undergraduate and degree level courses. In North East India, DBT graduates are awarded a Diploma, BA or MA in Bible Translation by Martin Luther university in Shillong depending on their prior education. To develop relevant attitudes, skills and knowledge. What will your legacy be? Please consider a contribution to The Word For The World! Become part of the vision to bring God’s Word to all people in their heart language by 2050. If you have any questions, concerns, or comments, please contact us using the form below. If you are a prospective student, please check out our Admissions page, and then send us the required information at training@twftw.org.